Uposatha days are times of renewed dedication to Dhamma practice, observed by both lay people and monastics throughout the world of Theravada Buddhism. For monastics, these are often days of more intensive reflection and meditation. In many monasteries, physical labor (construction projects, repairs, etc.) is curtailed. On New Moon and Full Moon days the fortnightly confession and recitation of the Patimokkha (monastic rules of conduct) takes place. Lay people observe the eight precepts on Uposatha days, as a support for meditation practice and as a way to re-energize commitment to the Dhamma. 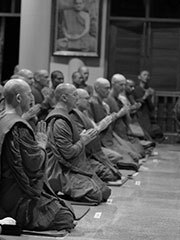 Whenever possible, lay people use these days as an opportunity to visit the local monastery, in order to make special offerings to the Sangha, to listen to Dhamma, and to practice meditation with Dhamma companions late into the night.